No, your not the only person to read cook books, and I have to admit to being quite jealous of you getting a copy of this for nothing. If you are into reading cook books as well making and enjoying the produce. Then the Sophie Dahl book is worth a look, apparently she was quite annoying on the telly but I picked up my copy before the telly and avoided it. Yum - that cake sounds good. My only disappointment is that because it is a back to basics book it felt a little pedestrian and I have books which already tell me how to make a lot of the recipes - Mary Berry's baking bible for example. But it is beautifully put together and my first encounter with River Cottage. Clover - I can't abide Sophie Dahl on television and so never looked at her books. 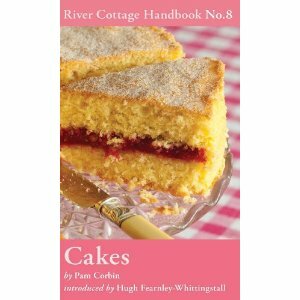 The river cottage ones are excellent (though heavy on the wholemeal)although as Verity says this one probably has more for beginer bakers because it's a lot of basics. I saw an episode of River Cottage bites today (Cakes) and my wife fell in love with the Savoury Muffins. She would love to make them but doesn't really want to buy the whole book as we don't eat sweet things. Is there any chance of putting the recipe up so I can surprise her? I'd be very grateful. Thanks.